The reason for the 2018 bun throw was to celebrate, one hundred years ago, the end of the WW1 . 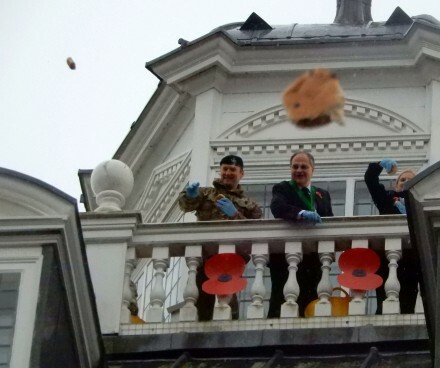 The dignitaries, aided by a few soldiers with good throwing skills, threw the buns. 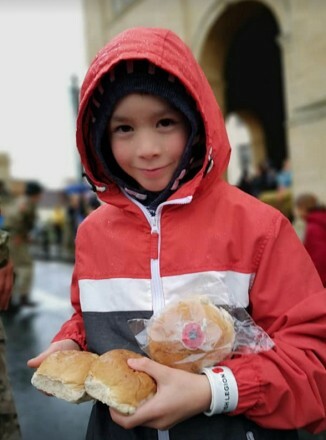 Thankyou to Elizabeth for sending me this picture of her grandson with some buns. One is the special centenary buns with a poppy. Richard Gottfried has been running the World of Bun Throwing Blog since 2006, and has attended every bun throwing in his lifetime. 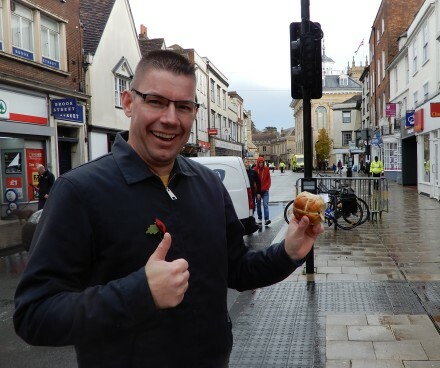 He was born in Abingdon and comes back for every bun throw. This time he got hit by a bun while taking a selfie. 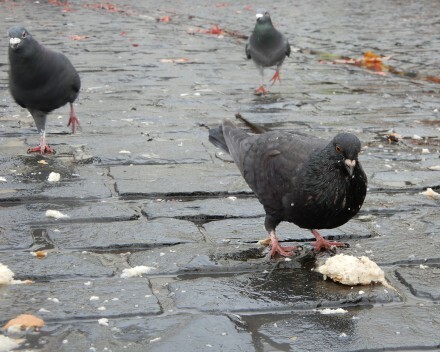 After the people had gone there were rich picking for the Abingdon pigeons. They love bun throwing too. A great bun throw. A wonderful Abingdon quirk. I don’t know whether it’s been long established, or just the first time I’ve noticed a ‘mosh pit’ for smaller children at the foot of the County Hall, in front of the main crowd. No adults dangerously jumping about around little kids (unintentionally, I know) to catch buns, just, I’d guess, five-to-ten-year-olds running about in a state of high excitement, in a relatively large space and with some supervision. 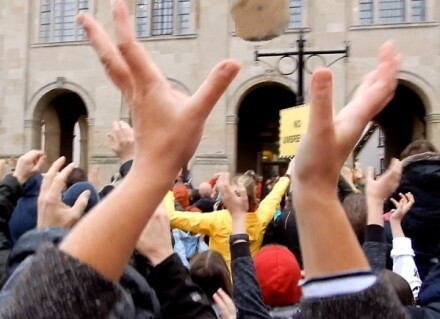 I only mention this as, after the bun-throwing, I bumped into a couple with three petitios and their mother explained that they’d only found this mosh pit by accident. It would be nice to see it more widely advertised. I heard someone say that Layla was there? I thought she’s more elusive than catching a bun! Is it true, is it true…was she here; in Abingdon; I mean actually here!? Hi Daniel, I got some pictures with Layla throwing buns but they were a bit blurred with rain so did not use. I expect the official photographer on the roof got some better ones. The only rooftop pictures I have seen didn’t show any Lib Dems – I think I saw Daniel in one of the crowd shots, though! I have seen a pic of Layla reading from the Roll of Honour in St Helens. PS just seen Martin Wackenier’s set on Facebook – close-ups of Layla – and Mayors, past and present – and even Backstreeter himself! Yes, I was there Hester. 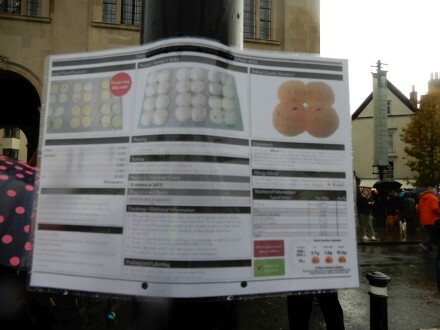 I wanted to see what the buns were like…and I can confirm; the flour was lovely! Brilliant to see you at the event. 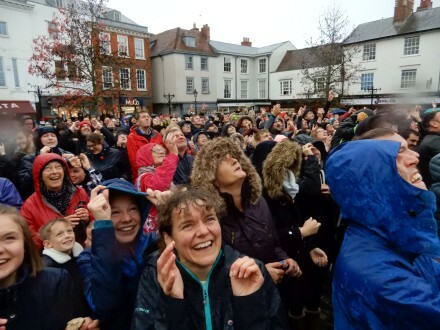 It’s always wonderful to come back to Abingdon for the Bun Throwing. Such a marvellous tradition.